Exciting news! Arsenal play the first home match of the season with the traditional 3pm Saturday kickoff. That means we get the 7am local time kickoff! Breakfast and football, two of my favorite things. Also, the match is on Fox Soccer Channel here in the states and so I will be watching it here in my living room, which means that I will continue last week’s live-blogging experiment. Stop by the site during the match for live commentary. Bad News! Everyone is injured! Specifically, Gallas, Sagna, and Bendtner have picked up injuries which the dot com is saying will keep those three out for both this match and the Tuesday match against Fener. Still being examined is Cesc Fabregas (broken nose), Robin van Persie (ubiquitous muscular) and Johan Djourou (concussion), I’m hopeful because the boss seems confident that the three will be available and it’s not like we can suffer too many losses. Meanwhile, coming back into the squad is Abou Diaby. Yay. So, to recap, people out are Rosicky (hamstring tendon, possibly December), Eduardo (Taylor broke his leg, possibly December), Gallas (hamstring), Sagna (knee), and Bendtner (ankle). I would really love to try to guess what kind of lineup that Arsenal will come out with tomorrow but there are just too many variables, not the least of which is Wenger’s crazy lineups this season. Steven Hawking couldn’t mathmatically model Arsene Wenger’s lineups, so I’m sure as hell not going to try. Meanwhile, Everton supporters are feeling hopeful that their team can come in to Emirates and get some points. They played us pretty well last year and everyone seems to think that this Arsenal team is even more vulnerable than the last. Moyes really has two options: rely on his defense (which hasn’t been very good this season) and try to pull a shock upset like they nearly did last season or try to pull a Hull. The former would be a little easier if Everton had retained Lee Carsley, or had Tim Cahill (out with suspension) at their disposal. No, I have a feeling that we’ll see Moyes go for the jugular and play a 4-4-2 with both Saha and Yakubu up front. Arsenal need to score quickly in order to kill that off, something they didn’t do against Hull. Either way, it should be an interesting match; if Everton goes for the smash and grab then we will get a chance to see if Arsenal have learned how to break down a defensive oriented team AND defend corners. And if Everton play open, attacking football, we’ll find out whether Arsenal have learned the lessons from Hull City (just saying that makes me ill). Should be a good game, regardless. Stop by tomorrow for the live blog. As I said yesterday, I wouldn’t be surprised if the boss had a word with Cesc (in private) and impressed on the young man that while his opinion is important and respected it is critical that you don’t publicly piss all over the tent. Lo and behold, pretty much immediately after his immature outburst he has issued a very public and 100% retraction of his foolish comments. Arsene has built an unbelievable squad here. Yes, we do have a lot of young players. But they have all shown they can handle it at the top level in the Premier League and the Champions League. We’re the envy of every other club and it’s so exciting to be a part of that. It’s hard to imagine I’m one of the oldest players at the club now but it will be a privilege to help guide some of these youngsters through. The future is bright. Players like Theo Walcott, Denilson and Samir Nasri have shown real class and I’m positive we have the quality to challenge for the title. I’ve complete trust in the manager’s policy. Arsene is the best at giving youngsters a chance. No-one else comes close to him for that. He doesn’t care how old you are, as long as you are good enough, and has the confidence to give young players a chance. Anything said to the contrary is simply not true. I’d like to reiterate to all Arsenal supporters that I am 100 per cent behind the team and manager. Huh, must have been something lost in translation because this is a complete repudiation of every single point that he made just the day before. Far from the criticism that so many of the Arsenal fans wanted it be, this is Cesc the team leader speaking. So which is he? The whiny little kid who wants someone to lead him or the strong leader who wants to pass on his experience to this young team? The truth, to paraphrase George Carlin (RIP), is somewhere in the middle. 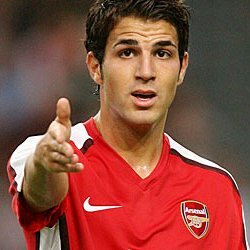 I’m willing to say that Cesc probably does miss Hleb, they were best friends. Also, coming off 10 days of playing with his Spanish teammates and having the likes of Puyols and Senna around to be sort of father figures to you would be very powerful. On the other hand, given all the positive statements he’s said about the team, I think he really does believe this last statement. He is hopeful about the future, he does want to be a leader, and he does love his new teammates. As much as I’d like to see the second statement as the true Cesc, I have to see both statements as sort of “growing pains.” Cesc will be the leader that both sets of fans want, but just not quite yet. Thanks for everyone who participated in yesterday’s poll (according to which, this blog is 33% awesome!). I won’t put one up every day, but instead will have one every Friday and since today is Friday… here’s your poll!